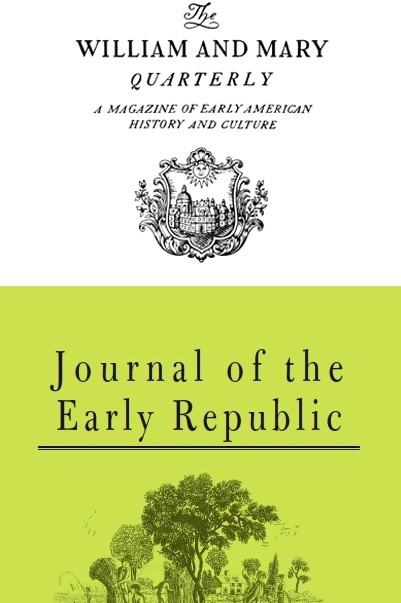 The editorial teams at the William and Mary Quarterly and the Journal of the Early Republic have asked us to share the call they’ve put out for a special joint issue on “Writing to and From the Revolution.” In addition to the journal publication, the editors are planning a conference next year hosted by the Fred W. Smith National Library for the Study of George Washington. See below for details, including contact information for the journal editors. “Writing To and From the Revolution” aims to approach the American Revolution as a series of unresolved historiographical and methodological questions, asking what it means that colonialists with an interest in the eighteenth century often find themselves writing toward the Revolution while scholars of the early Republic typically find themselves writing away from it. The assumption that American independence forms a watershed—perhaps the watershed—has had remarkable staying power, especially given the ways in which the histories of colonial North America and the early U.S. republic have been and are being transformed. Our goal is less to craft a new interpretive synthesis or unveil a novel paradigm than to explore a series of questions: How and why does it matter that many of us still write to and from the Revolution? Are there better ways to conceptualize change and continuity—not only with regard to periodization, but also with regard to geographies, social structures, polities, economies, and cultures? How has writing to or from the Revolution shaped the ways in which we have written about the Revolution itself? We will consider essays that are case studies or historiographical pieces, but we are especially eager to see work that marries the characteristics of those genres to those of a more open-ended think piece. Although the WMQ and the JER will publish separate sets of articles speaking to each journal’s particular concerns and constituents, the two issues will share an introductory essay, written by Alan Taylor, and a concluding essay, written by Serena Zabin. Arrangements will be made to ensure that subscribers to one journal are able to access the essays in the other journal. Contributors to both issues will convene at Mount Vernon as guests of the Fred W. Smith National Library for the Study of George Washington on March 18 and 19 for a workshop to discuss pre-circulated drafts. Travel expenses up to $500 will be reimbursed; lodging will be provided, as will most of the participants’ meals. Final articles, running c. 8,000 words, will be peer reviewed. The journals project a publication date of late 2017. 250–word proposals are due by Oct. 15. Proposals to the WMQ should be submitted to kscraw@wm.edu. Proposals to the JER should be sent to jer@shear.org. Please direct inquiries to Joshua Piker (japiker@wm.edu) or Catherine E. Kelly (cathykelly@ou.edu).